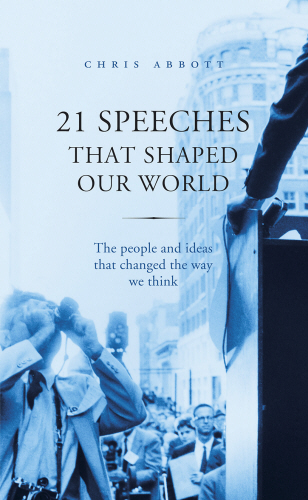 In this thought-provoking book, Chris Abbott takes a close look at twenty-one key speeches that have shaped the world today. Drawing upon his expertise as a leading political commentator, Chris explains how our current understanding of the world is rooted in pivotal moments of history. These moments are captured in the words of a range of influential – and occasionally controversial – figures, from Winston Churchill to Osama bin Laden. The speeches in this book are arranged thematically and each transcript is accompanied by an insightful commentary that explores how the speech relates to modern society. This is a fascinating tour through the tides of events that have shaped the last one hundred years. By examining different worldviews and exploring how they have developed, Chris shows how we can come a step closer to understanding others and avoiding the mistakes of the past. Fresh and relevant, this is a book that will make you stop in your tracks and think about what is really happening in the world today. Available in hardback, paperback and for Kindle. Published in English (Rider Books), Korean (Eiji 21), Japanese (Eiji Press), Russian (Astrel) and Portuguese (Bertrand Editoria). ​​"Chris Abbott introduces and pulls together a fascinating gallery of speakers and turning points in recent history."